The bridge over the Malacca River (1), on Jalan Hang Jebat is the best place to begin a historical tour of the city since this part of town is where it all began back in the 14th, century. Old, elegant, Indonesian sailing perahus and wooden barges still crowd the nearby docks. Charcoal and rice from Sumatra are unloaded and bartered for Malaysian foodstuffs much the same as in those olden times when Malacca was a great seaport. Beside the bridge is the Town Square with its terracotta red Dutch colonial buildings. To the left is Christ Church (2), the oldest Protestant church in Malaysia, built in 1753. In the centre of the square is the Tan Beng Swee Clock Tower (3), built by his wealthy Baba family in 1886. Under the tinkling waters of the Queen Victoria Jubilee Fountain (4), in the middle of the Town Square, trishaw drivers await their customers. If you feel inclined to be driven around, these self proclaimed tourist guides will give a good tour of Malacca's historical sites, peppered with a lively narration at a reasonable price. Dominating the Square is the impressive 'Stadthuys' (5), once the home of the Dutch Governor and now the Musium Sejarah, Historical Museum. Housed in its solid red walls are artifacts from every era of Malacca's colourful past - Dutch sideboards, Nyonya wedding costumes and Ming porcelain dating from the Malaccan Sultanate. 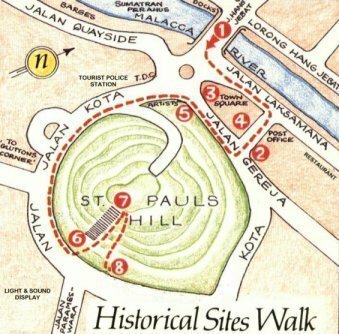 Follow Jalan Kota, around the base of St. Paul's Hill, to Porta de Santiago (6), the only remaining ruin of the great Portuguese fort A Famosa, built in the 16th century. From here the circular walk takes you around the original circumference of the old fort which covered the whole of St. Paul's Hill and housed the Portuguese nobility. It contained five churches, two hospitals and administrative buildings. When the British destroyed the fort in 1806, Malacca lost its most dominant historical feature. Climb the steps to St. Paul's Church (7), now a ruin. Built by the Portuguese in 1521 it was originally named Duarte Coelho and was a, Catholic church. The empty grave of St. Francis Xavier lies in the centre of the church and massive granite tombstones from Dutch times line the walls. Come back down the stairs to Jalan Kota, turn left and you can't miss seeing the Malaccan Sultanate's Palace, or Istana (8) constructed in the mid 1980's. The superb reconstruction uses traditional materials. The original istana was built in the time of Sultan Mansur Shah, (1459-1477), during the Golden Age of the Malaccan Sultanate. People of all faiths settled in Malacca many centuries ago and built their temples, mosques and churches in the same neighbourhoods and practised their different religions with acceptance and harmony. Begin this tour at the oldest of all the buildings - the Cheng Hoon Teng Temple (1), in Jalan Tokong in Chinatown. Buddhists, Taoists and Confucianists worship together in this elaborately decorated temple built in the mid- 17th century. Alongside the temple are paper and incense shops crowded with offerings for Chinese worship. A little further up the road, on the corner of Jalan Tukang Emas and Jalan Lekiu is the Kampung Keling Mosque (2), built in 1748. It has an unusual pagoda-like minaret and a huge Victorian chandelier. Further up the street about 50 metres on the same side is the colourful Sri Poyyatha Vinyagar Moorthi (3), the oldest Hindu temple in all Malaysia. Turn right into Lorong Hang Jebat at the next crossroads and walk the back roads of Chinatown to the intersection of Jalan Hang Jebat. Cross the bridge over the Malacca River and you face the Town Square. To your left is the old Dutch Christ Church (4), the oldest Protestant church in Malaysia, built in 1753. The 12.8 metre long ceiling beams were each cut from one single tree. Continue up Jalan Laksamana, past the Youth Museum, Post Office, the bookshop, the Indian import shop and restaurants. On the right is St. Francis Xavier's Church (5), built in 1849 over part of the old Portuguese fort ruins. This twin-towered Gothic church is dedicated to St. Francis Xavier, known as the Apostle of the East, who spread Catholicism in the East in the 16th century. At the junction of Jalan Bendahara turn right into Jalan Temenggong and walk two blocks to the Malacca Sikh Temple (6). Walk further down Jalan Temenggong to the intersection of Jalan Munshi Abdullah. Directly in front is Bukit, China, the huge Chinese graveyard hill containing 12,500 graves, some dating back to the 15th century (7). Nearby, at the intersection of Jalan Munshi Abdullah and Jalan Puteri Hang Lih Po, is the Chinese temple of Poh San Teng(8). Shaded by a huge bulbous tree and set back in a white-washed courtyard, the temple is maintain by the trustees of the Cheng Hoon Teng Temple since the 1795. Adjacent to the temple is the Perigi Raja (9), the well of the Princess Hang Lih Po, who returned to Malacca with Tun Perpateh Puteh the envoy to China in 1459 as a present for the Sultan's harem. She and her 500 handmaidens lived at the base of Bukit China. From this intersection walk back towards the town centre via Jalan Munshi Abdullah to the junction of Jalan Bendahara. Turn right and walk two blocks up to St. Peter's Church (10). Built in 1710, it is the oldest functioning Catholic church in the country and is the parish of the Portuguese Malaccans. Bukit China, the hill dominating Malacca, covers 42 hectares and is the largest and oldest Chinese graveyard outside of China. Located on the northeast fringe of Malacca, the hill rises abruptly from the coastal plain, one kilometre inland from the Straits. Early morning or late afternoon, the only time to jog in the tropics, energetic Malaccans climb the stairs at the base of the hill on Jalan Puteri Hang Li Po, formerly Jalan Bukit China, which leads to the jogging trail. 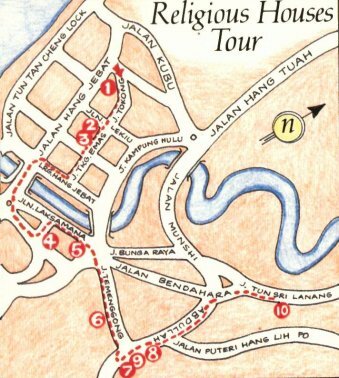 To reach the start of the trail, take the busy Jalan Munshi Abdullah past the Emperor Hotel to the intersection of Jalan Puteri Hang Li Po. On the right hand corner is the Chinese temple of Poh San Teng (1). Continue past this temple on Jalan Puteri Hang Li Po and take the first turn right, which is a driveway into a Chinese school(SJKC Pay Fong 3). The steps leading to the summit and the jogging trail are directly ahead (2). This well marked path winds up and down for about three kilometres, passing ancient graves dating back to the Ming Dynasty, marked Imperial Ming (1368-1644) (3), and some huge horseshoe shaped tombs of the Kapitan Chinas (4), heads of the Chinese community in colonial times. Two 15th century Malay Chieftains are buried on Bukit Tempurong Plain (5), and several old keramat, sacred Muslim graves are found on the northeast foot of the hill. From the top the view is magnificent, a full circle panorama of Malacca, from lime green padi fields to Pulau Besar and its neighbouring islands out to sea. St. John's Fort (6) glows white on a nearby hill and the patchwork of red tiled roofs of the old city merges with the high rise buildings of a new Malacca. On the easterly side of the summit look for some unmarked flat stones which form part of the foundations of the Madre de Dios, (7), a Franciscan Monastery built in 1581 by the Portuguese. Before the Dutch siege, Commisary Justus Schonten, described 'Madre de Dios' as the most healthy and beautiful spot in Malacca. 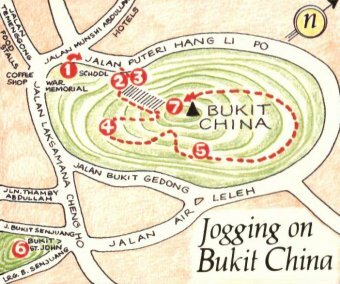 Bukit China was the centre of a controversy in early 1984 when the State Government wanted to develop it, raze the hill and dump the earth into the sea for a reclamation project. The Chinese community, however, succeeded in winning the battle to keep Bukit China as their ancestral grounds. The battle renewed interest in the hill, which used to be deserted and overgrown with lalang grass. Volunteers have planted trees, built the jogging trail and have embarked on an ambitious beautification programme that now draws many Malaccans to enjoy the only large green belt in the city area.